Japanese audiophiles have a figurative way of glorifying the 300B tube. They call it "the ball of dream and fantasy". This poetic analogy had long since been adopted by the Hong Kong audiophiles when I came to know about 300Bs. 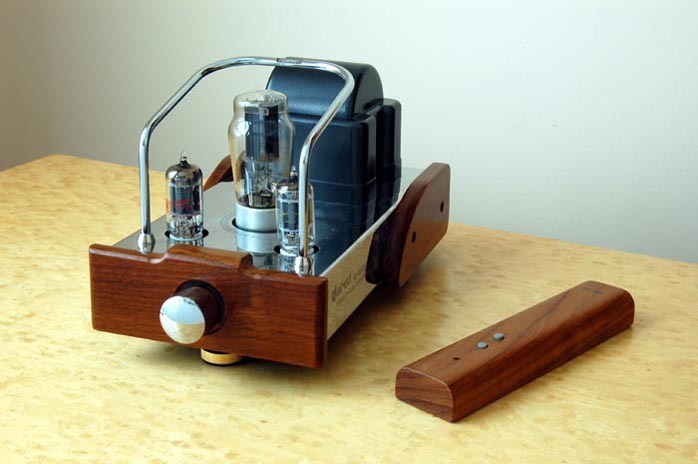 So it's only natural that a 300B single-ended triode amp would always have been in my dreams. Owning one is a romantic affair after all. And I've been pursuing one such sordid affair for many years. I know I'm no longer young but still, I didn't want to rush any tryst. I'm no Don Giovanni in this game (not that I don't want to, I can't afford to). I'd have to play it cool or I'd get my heart broken. Well, in fact I once did. Three years ago, I purchased an ABMIC (American Brand Made in China) 300B SE integrated amp for $2,000+ . It suffered so many QC problems that I had to send it back for a refund. The romance was short-lived but I did get a taste. I had my sweet moments. Then I had the Song Audio SA-1 preamp and SA-300 monoblock for a couple of months, planning to write a review for a Chinese magazine whose management eventually called off the assignment. The Song Audio flagship combo is a $10,000 affair in which Mr. Song Kim realized his personal dream of valve passion and has been earning critical acclaim for it ever since. It skews towards the more traditional, legendary kind of 300B sound - very rich and warm, very relaxed and decidedly musical. The only thing that deterred me from keeping that trio was price  not unjustifiable, mind you, this retiree just couldn't justify it for his reduced income lifestyle. So this Korean woke up from his 300B dream to shift allegiances. You see, Chinese audiophiles have their own way of glorifying valves. They call the 845 "King of Tubes" and the 300B "Queen of Tubes". It's probable that this deflected me at the last minute to swear loyalty to the King and acquire the Dared VP-845. After serving under His Excellency for two years, I sold my heavy-weight King of Tubes integrated because His Excellency had unceremoniously torn my left rotator cuff and didn't pay for the physiotherapy. If there was one side effect from my coup d'état, it's that I started to long for my Queen ever more ardently. Choosing a Queen is far more difficult than finding a King - unless you're Henry VIII. From the MIC list alone, there must be over 15 contenders to consider. 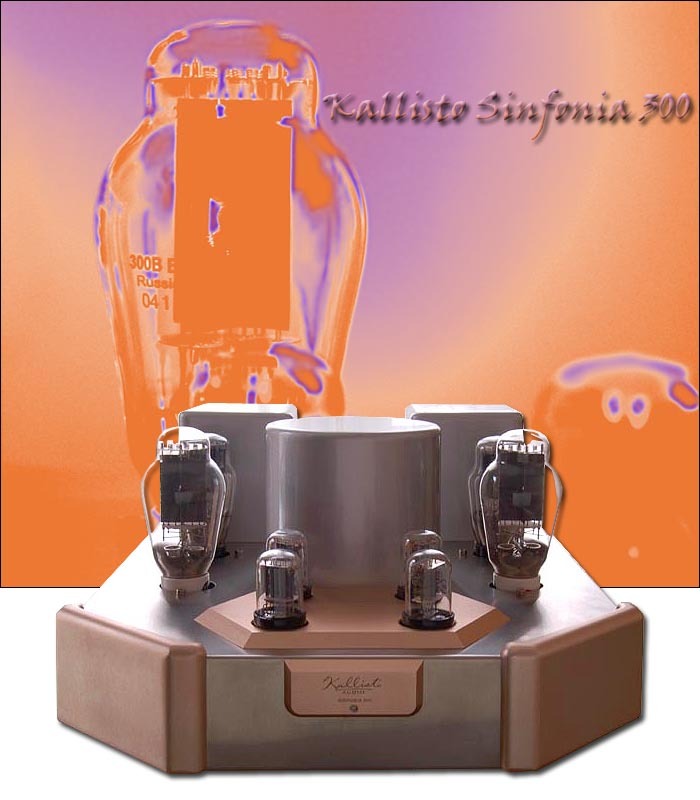 The Kallisto Sinfonia 300 is one of the up-and-coming names on the respectable CBMIC list, the first 'C' meaning Canadian. Based in Toronto, Canada, Kallisto Audio is the brainchild of two designers, Bruce Ng and Lawrence Lin, who both wreck their brains in the computer business (one in software, one in hardware) during normal daytime hours and wade in their audio passions the rest of the day - and night. The Sinfonia 300 is the only product they make at present. One brand, one power amp. But as a matter of fact, this amp is only 50% Chinese. The other 50% is completed -- or more precisely, handcrafted -- in Canada as Lawrence explained it. "The final voicing and quality control has to be done by ourselves. That's the most important part. Any factory in China can assemble anything for us. But we are responsible for the final outcome. We are obsessed with craftsmanship. We actually enjoy putting our finger prints on our own products." When they delivered the Sinfonia 300 to me a few months ago, my first question to the duo was: "Why isn't it an integrated amp?" My direct question was met by an honest answer: "With a power amp, it is easier for us to achieve the desired sound. But we also want to give our customers a certain leeway. Adding a preamp section tends to limit that. We have our own idea of how a 300B should sound or what sound we'd like to get out of a given 300B tube. 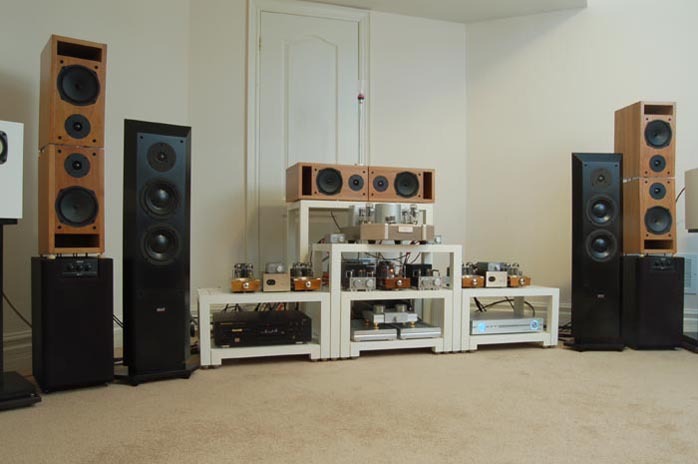 Using our platform, customers can fine tune with their favorite preamp." I didn't let them off the hook so quickly. "So are you going to have a preamp of your own?" I thought that was a legitimate question considering that most audio manufacturers would have a full line-up of products. "We are working on it." There came the relief. are the power on/off switch, IEC receptacle, RCA inputs and 4/8 ohm binding posts. For the first few weeks, I enjoyed the freedom of roaming from preamp to preamp, taking my time for the Kallisto to break in. During that period, I began to form an impression of the kind of 300B sound the Kallisto was trying to achieve. Though it's still rich and warm, it's not so traditional in terms of the legendary 300B valve sound. While it still flatters string instruments and vocals, it has more revealing power in terms of texture and detail. 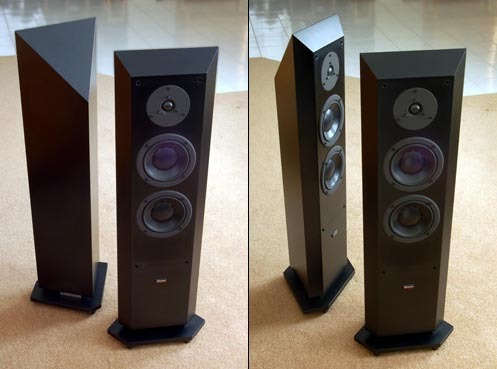 Some audiophiles like to compare 300Bs with 2A3s. 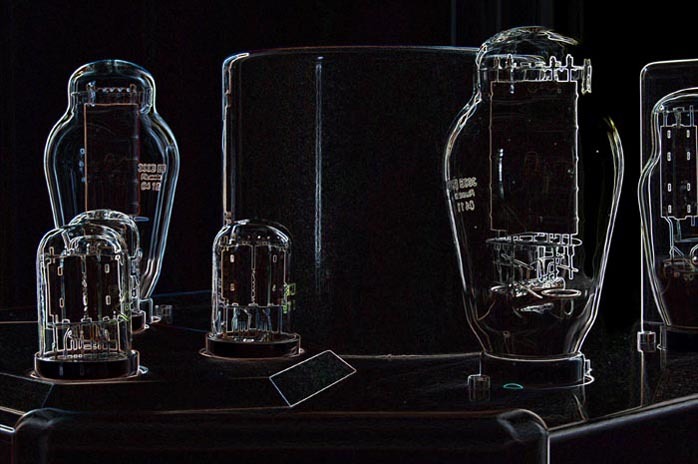 Both tubes have a similar physical look and construction and are direct-heated triodes favored by purists. The 300B operates on higher voltages (filament 5v/plate 300450v) and, in a single-ended Class-A configuration, yields an output of 8 to 10 watts. The 2A3 operates on lower voltages (filament 2.5v/plate 250300v) and, in the same configuration, yields a much lower output of only 3 to 4 watts. The general consensus is that a 300B amp will have more body and a warmer mid to lower resonance while the 2A3 will exhibit more finesse and resolution. Comparing the Kallisto to my Dared MP-2A3C somehow confirmed that theory except that the Kallisto did not fall short on finesse and resolution. I guess it's fair to say that the Kallisto was designed to close the gap between 300B and solid-state amps without betraying its valve identity. One day, Bruce delivered to my door an Audio Note M1 line preamp. It's the partnering gear they'd been using in one of their dealer's show rooms. I've been to a number of audio shows that featured Audio Note products and more recently an Audio Note showcase event at the same dealership. I must confess that I never liked the Audio Note signature sound. For my taste it is a valve bloom extravaganza. Orchestral soundstages are oversized and cluttered. Even chamber music is larger than life, violin indulgingly rich. To me it equates to valve obesity. But I'm sure that for a lot of people, it's pure valve ecstasy. Audio Note wouldn't be where they are today for nothing. Personal preferences aside, I happily hooked up the M1 to the Kallisto, winding up with my Restek CD player and Loth-X BS-1 on either end. Quite unlike my previous all Audio Note system experience, the Kallisto and Loth-X carved out a well-proportioned sound image from the M1. 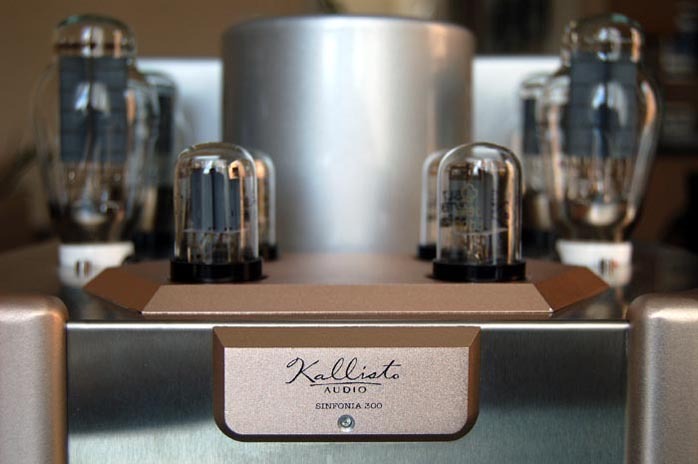 I wouldn't be surprised if the Audio Note preamp helped close more sales for the Kallisto than one of their own power amps at the AN dealership. But that's wishful thinking on my part. You know how status symbols cast spells among audiophiles. The Kallisto is just the new kid in town. (Bruce later told me that the reverse is true. The Kallisto helps sell more M1s, ironically for the same reason.) Anyway, the M1 still gave the entire sound spectrum a buttery feeling. Nice about that was how the butter was fresh from the fridge instead of helplessly melted down after a heated conversation over the dinner table. It's actually quite nice - a full, rich valve color if that's your cup of tea. To most people, the mid to lower tonal spectrum is undeniably 300B, especially with Gary Karr playing Bruch's Kol Nidrei on his 1611 Amati contrabass or his own transcription of Deep River [King Record KICC 45]. Violin also sounds richer than reality as testified by Arturo Delmoni's Songs My Mother Taught Me [Mobile Fidelity MFCD 877]. Vocals sound heavenly too. With Now the Green Blade Riseth sung by the Stockholm Cathedral Choir [Proprius PRCD 9093], the multi-layered harmonics from the mixed chorus sounded like echoing in a Medieval stone cathedral. These CDs have been hailed by audiophiles as reference grade recordings for many years and they are absolutely flattered by any tube system - or solid-state for that matter. octane full-blooded performances that often send the VU meters into the red and push the speakers to their limits, therefore having been criticized by some discerning ears to be "dry". The M1 did a very tactful job of toning down the abrasiveness and rounding off the edges. After all, sugar coating is always more palatable for the masses. For me who never minds that kind of abrasiveness and always keeps a watchful ear on my audio sugar intake, I see that as a faithful documentary of the interpretationist style. instruments in real life can be abrasive when pushed. I won't blame them. Their kind of idealized sound is addictive. While I was still sober, I moved on to the Dared SL-2000A, my favorite tube preamp in the $500 category [below]. While my memory was still fresh, I played all the same CDs again. The first thing I noticed was how the cholesterol was immediately restored to a healthier level. The treble replenished with more texture and definition, which in turn helped the imaging. The mids and bass were tighter and packed more punch. Seeing that my earlier valve bloom phobia had gradually subsided, I substituted the 94dB 8-ohm Loth-X with the 83dB 4-ohm Dynaudio Facette. The Facette is one very fickle and unpredictable speaker about which, after all these years of love-hate partnership with most solid-state amps, I can now confidently state that it works extremely well with NuForce -- and, for some inexplicable reasons -- SET amps. Digital amps with high damping factors didn't surprise me. Tube amps I cannot explain. The first time I chanced about this fortuitous mating was with Song Audio's lovely SA-34 SB. 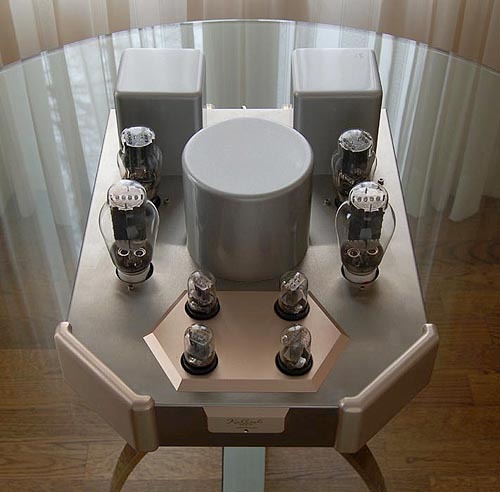 Nobody would ever believe that this SET could drive the Dynaudios. But it did. The tiny integrated amp delivering a mere 4 watts per channel suddenly made the stubborn Facette open up and sing. With the Kallisto Sinfonia 300, the Facette sang even more eloquently and con brio! I used it with and without the Assemblage D2D-1 sample rate converter combined with their DAC-3.1 Platinum D/A converter. 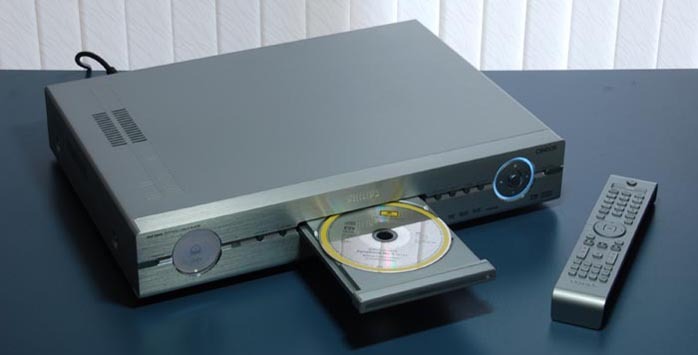 Other source equipment included a Marantz SA-8260 CD/SACD player and Philips' DVP-9000S universal player [below]. The Restek is the most neutral of them all. When the Assemblage's 24-bit/96-Hz upsampling is added, resolution elevates. However, the Assemblage D2D/DAC behaves quite differently when the HDCD decoding circuit is engaged. Then it gives the most natural un-hifi rendition on HDCD discs. The Marantz is the equivalent to the Restek when reading CD and SACD. It is the Philips that attains the highest resolution among the four. With its PCM-to-DSD upconverting, even less than ideal CD recordings can be drastically improved.